An illustrated city walking guide like no other. 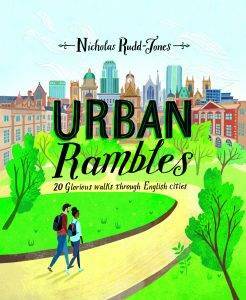 Whether you’re a city-dweller who wants to explore your home turf, or a keen country walker who likes the idea of trying something different, or a discerning weekend breaker who wants to get under the skin of a city in a day or two, Urban Rambles is the book to inspire you to get out and explore your nearest city on foot. England’s cities have become much more walkable places in the last decade, with huge investments in green spaces, redevelopment of old industrial areas and a complete urban planning re-think in favour of pedestrians. Walking in a city is the healthy lifestyle choice, offering you the chance to exercise and the calming powers of green spaces. Choose from cathedral cities like York and Lincoln, seats of learning like Cambridge and Oxford, trading ports like Bristol and Liverpool, cities designed for pleasure like Brighton and Bath. 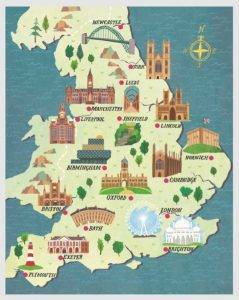 Choose to visit Victorian industrial cities Manchester, Sheffield and Birmingham, and of course the nation’s capital, where a new 25-mile circular route takes you from urban regeneration through the Olympic Park and past rivers, parks and palaces. Hello Nicholas. I was directed here from Walkingworld. I have just read the entry for Manchester and found it fascinating. I know Manchester a little as my son lives there. Next time I go we’ll have to try the walk. Looking forward to the walk in Newcastle. BTW there seems to be some typos – it’s PONTE VECCHIO. Nick, thanks for your positive comments; and the bridge has now been fixed! Nicolas, what a great idea to encourage people to explore their own and other people’s cities! I’ve also got here from Walking World – you’ve done Leicester well: things I knew and things I didn’t. I’m looking forward to walking Peterborough, Lincoln and Nottingham – guess you’re based in the Midlands. Two Leicester typos: under BEST FOR – Jewry Hall for Jewry Wall; end paragraph ‘Incidentally, David Attenborough…’ yiu instead of you. When are you doing Bristol? You’ll definitely have to do more than one walk here – lots more to see. Next one try to include the Arnos Vale Cemetry, a Victorian Cemetry being reclaimed by the community + v atmospheric. This is a great site I’ve stumbled on through Twitter. I enjoyed reading the Bristol walk – thanks. Great minds think alike – I am currently writing that one up – Bristol Temple Mead, Arnos Grove, Perretts Park, Vicotria Park, Queen Square, Old town, Castle park. Check back in a month. Nick. Thank you for the Glasgow walk. We are planning to spend four days there in early June tracing family history. We will certainly be following this walk as we walk in the steps of ancestors. Directed here from Walkingworld. What a great idea! I have looked at “Manchester” which we know quite well as our son spent six years at University there and at “Edinburgh” which we thought we knew quite well as he lives there now with his wife and two little girls. However, in both places there were parts we had not come across before – in fact, I am sending the link to Simon in Edinburgh. I hope you will be doing our city of Preston – a reasonably new city and it is quite often overlooked. That would be really interesting – see how much I have missed even though I have spent all my life here. Hi Marian, Annabel here (author of the Scotland chapters) – I am a student at Edinburgh currently and I think I might know it better than any of my Scottish friends! It’s amazing how subjective one’s experience of a city can be. I hope Simon enjoys the chapter – do let us know what he thinks. Congratulations on this wonderful site! 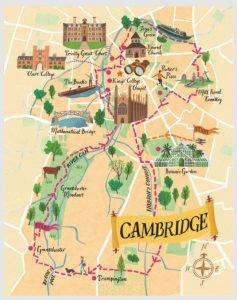 As a local-to-Stamford resident of 20 years (from London) I still have the smoke in my veins , so will definitely be sampling some of these walks. Thanks for your kind words! I am also the editor of Stamford Living and do rural rambles! Hello. I have got your walk book and am very keen to start exploving. Could you kindly direct me to the mobile phone GPS enabled maps for the walks please. Many thanksin anticipation. Go onto the website at urbanrambles.org, go to right-hand column, double-click on the city you want to visit, the google map is at top of the page, with detailed step by step instructions – can use on iPad or phone.